Water (or osmotic) potential values caused by the basic components of some widely used culture media in liquid form and nutrient solution for hydroponics. The values are converted for use at 25 C. The basic components consist of inorganic salts, vitamins and the other organic substances excluding sugar (Fujiwara and Kozai, 1995). 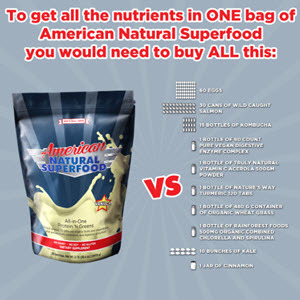 Narrowly defined, photoautotrophy is a nutritional type where living organisms grow without any additional exogenous organic components as nutrients. When defined in this narrow sense, media in photoautotrophic micropropagation should exclude all organic components. As in hydroponics, media for photoautotrophic culture consist exclusively of inorganic components. Vitamins, growth regulators, and gelling agents should not be added to the medium in photoautotrophic micropropagation. Instead of gelling agents, porous substances like vermiculite should be employed as supporting materials in photoautotrophic micropropagation. As will be discussed in later chapters, use of such supporting materials along with liquid nutrient solution under controlled environment has beneficial effects on the growth and development of in vitro plantlets. Root growth is a primary target for Al toxicity in plants. Maintenance of root elongation rate under Al stress is frequently used for Al tolerance screening purposes in hydroponics (Llugany et al. 1994 Ma et al. 2005 Narasihmamoorthy et al. 2007). Monitoring root elongation rates of maize varieties during the first minutes and hours upon exposure (Llugany et al. 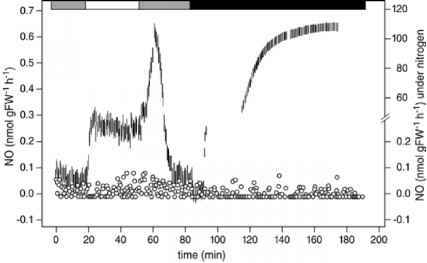 1995) reveals various response patterns (Fig. 1) (1) The threshold of toxicity model, where a threshold time of 15-45 min and a threshold concentration (usually of a few mM) is required before Al-induced inhibition of elongation is detectable (2) the hormesis response, where a transient Al-induced stimulation of root elongation followed by inhibition is observed, and (3) the threshold oftolerance response, where a fast inhibition of elongation is followed by a recovery in the growth rate (Barcelo and Poschenrieder 2002). To enable a controlled variation of environmental parameters, growth monitoring systems have to be put in growth chambers or in controlled conditions of greenhouse facilities such as the Biosphere 2 Center (Walter and Lambrecht 2004) where the setup is protected from advert conditions like wind, rain or dew and where for example the effect of altered atmospheric CO2-conditions can be studied in detail. For root growth, image acquisitions have been performed either in agarose-filled Petri dishes (Beemster and Baskin 1998 Nagel et al. 2006) or in hydroponic cultivation systems using an inclined base plate (Walter et al. 2002b, 2003a). In both systems, roots are situated in a translucent medium allowing optical recording, are well supplied with nutrients and forced to grow in two dimensions only. Ethylene (ET) is a signal molecule involved in the regulation of gene expression during adaptation to abiotic stresses. The relationship between ET and ABA production in vegetative tissues under abiotic stresses appears mostly controversial. 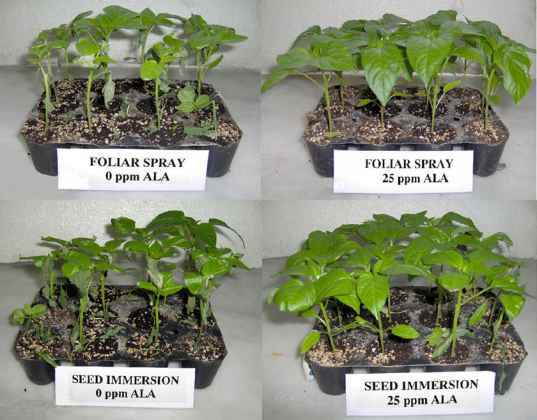 In order to ascertain the interplay between ET and ABA in young plants (5th leaf stage), grown hydroponically in control (3 mS cm-1) and salt stress (10 mS cm-1) conditions, ET emission, ABA content and dry weight (DW) of roots, basal and apical leaves were measured in five different tomato genotypes cv Edkawi (EDK), salt tolerant cv Gimar (GIM), relatively salt sensitive and its near isogenic line for the nor gene (NOR) defective in ET synthesis the ABA mutants sitiens (SIT) and notabilis (NOT), both with different ABA biosynthetic capacity (8 vs 47 ). Hydroponically, Zn and Cd were accumulated in the cell wall of the rhizosphere as Zn Cd phosphates (Kupper et al. 2000). Cell wall binding can prevent Cd from being transported across the plasma membrane. This delay in transmembrane uptake may represent an important factor in the defense against Cd poisoning in T. caerulescens, allowing time for activation of intracellular mechanisms for heavy metal detoxification (Nedelkoska and Doran 2000). Plants overexpressing mammalian MTs were reported to be unaffected by concentrations of 100 to 200 M cadmium, but growth of N. tabacum control plants was severely inhibited at external cadmium concentrations of 10 M 77 . Transformants of Brassica oleracea expressing the yeast metallothionein gene CUP1 tolerated 400 M cadmium however, wild-type plants were unable to grow at concentrations above 25 M cadmium in a hydroponic medium. Transformants grown at 50 M cadmium accumulated 10 to 70 higher concentrations of cadmium in their upper leaves than did nontransformed plants grown at 25 M cadmium. This indicates that the enhanced tolerance observed in the transgenic plants was unlikely to be a consequence of excluding cadmium from the leaves. And or plants during the rooting and acclimatization stages. This was an aseptic micro-hydroponic system with a nutrient solution control system. Roche et al. (1996) developed a commercial-scale photoautotrophic micropropagation for potato micro-plants in which 100 nodal explants were cultured under natural ventilation in a stainless steel tray containing a block of polyurethane foam (85 x 300 x 25 mm) and enclosed with a polyethylene sleeve. When some element is deficient or present in such high concentration as to be toxic, plants often have symptoms somewhat characteristic of the particular condition afflicting them. For example, yellowing of leaves, or chlorosis, often indicates a deficiency of nitrogen. Nevertheless, visual identification of deficiencies or toxicities is not a reliable procedure. 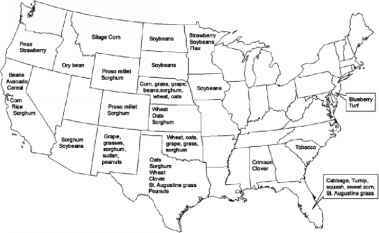 For example, sulfur deficiency may result in symptoms very similar to those of nitrogen deficiency. Therefore even experts check their visual impression by analyzing the tissue to find out whether its content of the suspected element is in fact below the value deemed adequate for that particular crop or present in excess. 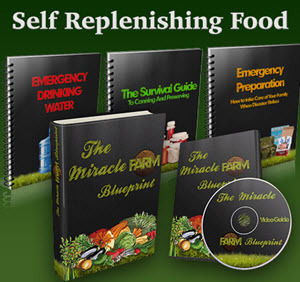 Often, such unrelated conditions as diseases caused by fungi or bacteria may result in the development of symptoms that mimic those of nutrient disorders. see also Biogeochemical Cycles Fertilizer Halo-phytes Hydroponics Nitrogen Fixation Soil, Chemistry of. It has been reported that PS release occurs for 3-4 hours after an increase of the temperature, either in the growth chamber or under natural conditions (Takagi, 1993). In order to confirm the time for PS release and to know the absorption rate of PS or PS-Fe3+ in the roots, experiments were conducted using barley grown hydroponically by K. Itoh in Iwate University (personal communication). Thus, only a careful consideration of chelate application, taking into account factors like soil type and its total Pb content, can enhance the efficacy of a phytoextraction strategy. EDTA has been shown not only to enhance Pb desorption from the soil components to the soil solution but also to increase its transport into the xylem and its translocation from roots to shoots 7,30-32 . Vassil et al. 32 demonstrated that Pb accumulation in shoots is correlated with the formation of Pb-EDTA in the hydroponic solution and that Pb-EDTA is the major form of Pb taken up and translocated by the plant via xylem stream. The physiological basis of the uptake of Pb-EDTA and, particularly, the possibility of this large molecule to cross the cell membrane are unknown. However, using extended x-ray absorption fine structure spectroscopy, Sarret et al. 16 confirmed the presence of a substantial amount of Pb-EDTA in Phaseolus vulgaris leaves, when this plant was grown in a solution of Pb-EDTA. More data on the relationship between the concentrations of PS and Fe in the xylem sap are necessary to discuss the role of PS on Fe translocation to the shoot in grasses. A feeding experiment with Fe3+ was conducted for barley grown hydroponically under -Fe condition. The time course for the changes in the concentrations of PS and Fe was observed after the plants were fed with FeCl3 (30 M) at 13 00. Eighteen plants of barley were decapitated at 3 hour intervals and xylem sap was collected for 3 hours. The change of the concentration of Fe or PS in xylem sap was monitored after the addition of Fe3+. Metal concentrations in xylem sap collected from barley grown hydroponically with different concentrations of EDTA-Fe (0, 1, 10, 100 M). Figure 14-7. Metal concentrations in xylem sap collected from barley grown hydroponically with different concentrations of EDTA-Fe (0, 1, 10, 100 M). As a follow-up research, an experiment was conducted to examine whether PS could enhance Fe concentration in xylem sap more than other Fe chelators, when fed to the roots together with Fe3+. Roots of barley plants grown hydroponically under -Fe conditions were supplied with FeCl3 (30 M) and equimolar amounts of other Fe compounds, such as mugineic acid (PS), deferri-ferrioxamine B (FOB) (a microbial chelator) (van der Helm et al., 1987), EDTA, citrate, and malate from 13 00 to 16 00 p.m., when PS are not released from the roots. At 16 00 p.m., the plants were decapitated and xylem sap was collected for 3 hours. The methods used in these experiments were described in Kawai et al. (2001) and Alam et al. (2001a). Barley plants were grown hydroponically in bunches in a greenhouse (Kawai et al., 1988b). Plants were decapitated at about 2 cm above the roots with a stainless steel razor. Xylem sap extruding from the top of the stunts was collected by a capillary tube and kept in a test tube. After collection of the xylem sap, the weight and density of the liquid was measured. The volume of xylem sap was calculated based on weight and density. The xylem sap was stored under -20oC until analysis. Seedlings fell over stems girdled or rotted at soil line. Cause Damping-off. This disease is caused by soil-dwelling fungi. To prevent it, disinfect reused poLs and flaLs before filling them with fresh seed-starting mix. To disinfect, dip them in a 10 percent bleach solution (1 part bleach to 9 parts water) and let them air-dry. Sow seed thinly to allow for air movement around seedlings. Cover seed with a thin layer of soilless mix or vermiculite. Water only enough to keep soil moist, not soggy. It had long been known that water, along with dissolved minerals, enters a plant through its roots. Sachs demonstrated that plants do not require soil and can be grown in an entirely liquid medium as long as the medium contains the minerals required for survival. This technique of hydroponics facilitated studies of the mechanisms for mineral uptake by the roots. 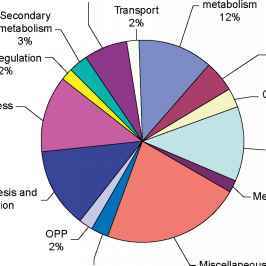 Another point is the distribution of metals inside the plants metal concentration in the plant varies with the organ and the age of this organ 31,61-63 . Figure 30.5 shows Cd distribution within leaves of S. viminalis grown in hydroponics Cd is located at the edges and tips of the younger leaves but is mostly at the base of the older leaves 64 . In addition, concentration varies with the species 65 , the metal 66,67 , and the soil characteristics. In general, Zn, Cd, and Ni tend to accumulate in shoots, whereas Cu and Pb remain in roots. 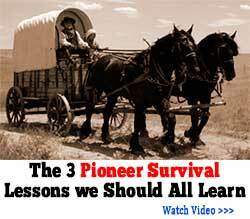 This has consequences for the time of the harvest and the parts to be harvested. Seedlings foil over stems girdled or rotted at soil line. Cause Damping-off. Disinfect reused pots and flats by dipping them in a 10 percent bleach solution and letting them air-dry before filling them with fresh seed-starting mix. Sow seeds thinly to allow for air movement around seedlings. Cover seed with a thin layer of soilless mix or vermiculite. Water only enough to keep soil moist, not soggy. Thin seedlings and spray with compost tea as soon as First true leaves open to help prevent the problem. Current advanced greenhouse technology for plant propagation and transplant production has been well developed for a large-scale production. Thus, for the development of a large-scale photoautotrophic micropropagation and transplant production system, technologies of plug seedling production, hydroponic culture, greenhouse environment control, and greenhouse crop management can be applied with careful consideration of disease protection. The current photoautotrophic micropropagation system can be improved further for a larger scale production by incorporating recent technologies of computers, robotics, energy-saving, recycling, environmental conservation, ecological engineering, etc. At the same time, photoautotrophic micropropagation is suitable also for a small-scaled operation. A, Drip-irrigation system used in dry areas in Hawaii B, self-propelled overhead irrigator used where drip irrigation is unavailable. Fig. 6.16. A, Drip-irrigation system used in dry areas in Hawaii B, self-propelled overhead irrigator used where drip irrigation is unavailable. 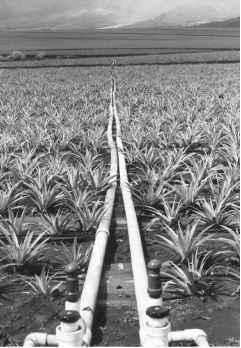 pineapple shows to drip irrigation (Fig. 6.16A). Alternate furrow irrigation can further enhance WUE by using less water. In sprinkler and drip irrigation systems, WUE is further improved as water losses are checked to a large extent. Sprinkler and drip irrigation systems are normally used in fields with uneven surfaces and in areas where there are severe water shortages. With surface and subsurface drip irrigation systems, the latter has higher irrigation WUE due to lower evaporation loss (Bhattarai et al., 2008). However, the initial high costs involved in establishing these systems is a major factor in these systems remaining unpopular among farmers. 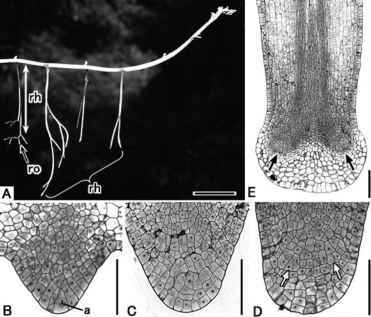 Zimmermann and Steudle (1998) compared the hydraulics of young roots of corn with and without an exodermis. 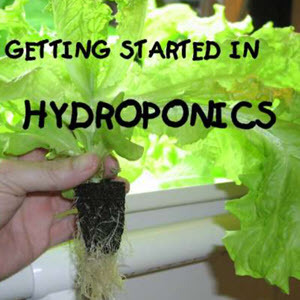 When the seedlings were grown in hydroponics, they did not develop a continuous exodermis. But when grown in mist culture they did, which reduced the hydraulic conductivity by a factor of 3.6 at constant water permeability of root cells. Recently, the thicker roots of Iris germanica have been studied by Meyer et al. (2010). When exposed to air, these roots developed a continuous multiseriate exodermis, which was uniseriate, when roots were brought up in hydroponics. As for the young corn roots, the treatment caused substantial changes in the root hydraulics measured by combining the root pressure probe and the pressure chamber. When present, the multiseriate exodermis was limiting water flow (as for corn grown in mist culture). AM fungi are rarely found in commercial nurseries due to the use of composted soil-free media, high rates of fertilizer application and regular application of fungicide drenches. The potential advantages of AM fungi in horticulture, agriculture, and forestry are not perceived by these industries as significant. This perception may be due in part to inadequate methods for large-scale inoculum production. Possible amendments for acidification include NH4-containing fertilizers, organic and inorganic acids, and elemental S. Trelease and Trelease 77 indicated that plant roots acidify hydroponic solutions in response to NH4 nutrition and cause solutions to become more alkaline in response to NO3 nutrition. Metal availability in the soil can be manipulated by the proper ratio of NO3 to NH4 used for plant fertilization by the effect of these N sources on soil pH, but no phytoremediation research has been conducted on this topic to date. In one of the models for the transport of Zn into vacuole, it has been postulated that malic acid would bind Zn in the cytosol, thereby detoxifying it, and the Zn-malate complex would be transported over the tonoplast into the vacuole where it would dissociate 39 . After this, malate would be retransported into the cytosol. Vacuolar Zn would remain bound to stronger chelators, such as citrate, oxalate, etc., when present. Brune et al. 151 reported that barley mesophyll cell vacuoles contain appreciable concentration of phosphate (30 to > 100 mol m-3) malate (> 10 mol m-3) sulphate (> 4 mol m-3) citrate ( 1 mol m-3) and amino acids (> 10 mol m-3) when grown in hydroponic culture. They hypothesized that these organic and inorganic salts interact with the divalent cations, thereby buffering the vacuolar free Zn concentration to low values even in the presence of high Zn levels (292 mmol m-3) in the vacuolar space. With the discovery of the soil fumigant 1,3-dichloropropene, 1,2-dichloro-propane, (DD mixture) pineapple nematodes were easily and economically controlled during the early stages of pineapple plant growth (Carter, 1943 Keetch, 1979 Johnson and Feldmesser, 1987 Caswell and Apt, 1989). Today, early nematode control is accomplished by clean fallow, preplant soil fumigation with dichloropropene at 224-336 l ha-1 (Fig. 9.17 ) and postplant application of an approved nematocide (e.g. fenamiphos and oxamyl) by broadcast sprays or drip irrigation (Fig. 9.18 Fig. 9.18. Postplant drip irrigation and application of postplant nematocides. Fig. 9.18. Postplant drip irrigation and application of postplant nematocides. This method allows a good accuracy of nutrient uptake over time (Klaring, 2001) and the results are comparable to those obtained by destructive long-term N measurements (Barak et al., 1996). However, a correct methodology should be applied to avoid errors in the measurements. Obtaining samples from the root environment is difficult, and samples of the drainage might not represent the composition of the nutrient solution surrounding the roots. In that case, a soilless system with a low inertia should be used (e.g. nutrient film technique and aeroponic system). Moreover, the system should avoid evaporation so that all volume losses can be attributed to water and nutrient uptake. Finally, this method is less accurate when nutrient solution concentration is elevated (Le Bot et al., 1998a) thus, diluted solutions are recommended. Propagating M. x giganteus using rhizome divisions entails separating a rhizome mass into small pieces for replanting. This can be done with potted plants growing in greenhouses and can also be conducted using field-grown plants. University of Illinois experience has determined that the potted M. x giganteus can often be divided every 4-8 weeks (Pyter et al., 2009) when grown in greenhouses under 12 h per day artificial light during winter using 10 cm square pots and an artificial, soil-less potting mix. One of the most clearly defined interactions between Fe-stress response mechanisms and another micronutrient is an interaction with Zn in navy bean. The Zn-inefficient variety, Sanilac, readily exhibits Zn deficiency while the Zn-efficient variety, Saginaw, does not. It was also observed that Sanilac accumulates Fe under Zn-deficiency stress while Saginaw does not (Ellis, 1965). These two cultivars were grown hydroponically under Zn-deficient and Zn-sufficient conditions. Two of the three Fe-stress response mechanisms (reductant release and reduction of Fe3+ to Fe2+ at the root) were activated by Zn-deficiency stress in Sanilac (Jolley and Brown, 1991), but not in Saginaw. 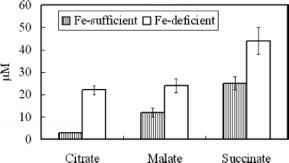 Consequently, Sanilac showed increased Fe uptake and aggravation of Zn-deficiency under Zn stress, while Saginaw prevents an imbalance of Zn and Fe by minimizing Fe uptake by actually reducing Fe reduction activity during Zn-deficiency stress. Some plants, such as those of the mustard family (Brassicaceae) and the sedge family (Cyperaceae), lack mycorrhizae. 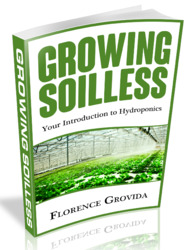 In addition, most plants growing in flooded soils (or under hydroponics) do not form mycorrhizae nor do plants grown where conditions are extremely dry or saline. Also, plants growing in very fertile (i.e., nutrient-rich soils) have less-developed mycor-rhizae compared to plants growing in nutrient-poor soils. 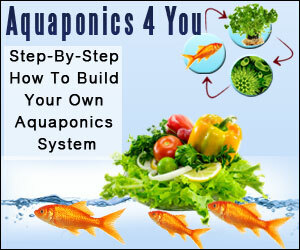 Therefore scientists devised a simplified method for growing plants, called solution culture, or hydroponics. In this technique the roots of the plants are not in soil but in water, which contains the dissolved salts of those elements considered to be essential. That way, scientists can control and monitor the chemical composition of the medium in which the plants grow. The use of natural soil, both in forcing or open field production, is typical of the Hungarian sweet Capsicum industry. 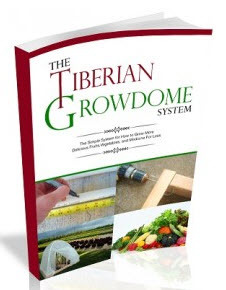 Growing without soil has only been recently achieved in greenhouses, which represent only 1-2 of the total production area. Because of the above-mentioned tilling, weeding is one of the most important cultivation projects. 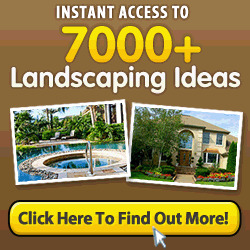 It is done by small garden machines or by hand in greenhouses. Drip irrigation is used for the irrigation and fertilization in 80 of the growing systems. Micro-dispenser irrigation is used for the rest. Overhead dispenser irrigation system (linear) is typical, but recently several farms switched to drip irrigation to save water. 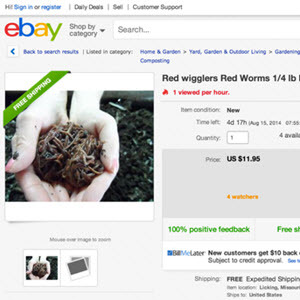 In Australia, yield losses occurred where root-knot nematodes were detected from 9 to 15 months following planting, suggesting that sampling may be important in determining the need for postplant nematocide applications (Stirling and Nikulin, 1993). While soil sampling during plant growth (to estimate nematode populations) should be important for nematode management, in practice postplant nematode control is frequently applied as 'insurance', based on qualitative data, along with historical yield and nematode population information. 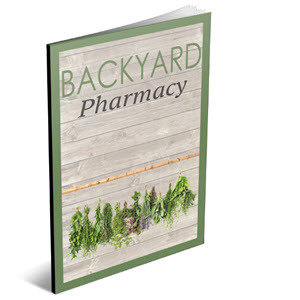 The non-volatile nematiocides, such as oxamyl and fenamiphos, may be applied postplant as foliar sprays or through drip irrigation systems (Caswell and Apt, 1989). 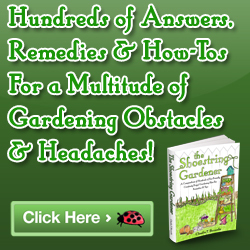 It is well known that characteristic visual symptoms of specific nutrient deficiencies may appear in plant tissues. However, most of the classic deficiency symptoms described in textbooks are characteristic of acute deficiencies, that is when a nutrient is suddenly no longer available to a rapidly growing plant. In commercial cultivation in soilless systems, it is more common to find chronic deficiencies, that is the result of an insufficient supply of a nutrient compared to the demand of the plant (Berry, 2006). For chronic deficiencies, visual symptoms are not that clear so other methods have to be used to diagnose nutrient deficiencies. These methods are based on the key roles that nutrients play in plant metabolism because limiting levels of a nutrient affect the metabolic role in which it is involved. Root respiration increases with root temperature (Lyons et al., 2007 Rachmilevitch et al., 2006b Xu and Huang, 2000). Oxygen is consumed at a high rate and, in addition, oxygen solubility is reduced as temperature increases (Jones, 1997). Accordingly, high root temperature is generally associated to hypoxia stress in soilless systems (Incrocci et al., 2000). 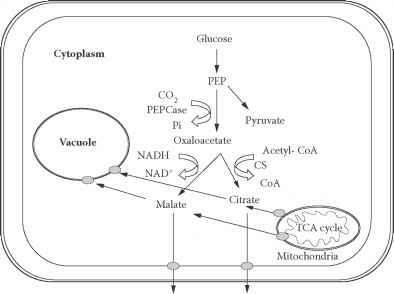 Respiration is a major avenue of carbohydrate consumption and may lead to shortage of assimilates when temperatures are too high. Actually, this fact has been proposed to be a primary factor responsible for root growth inhibition and dysfunction at high root temperatures (Kafkafi, 2008 Rach-milevitch et al., 2006b). The down-regulation of plant respiratory rates and the increase of respiratory efficiency by lowering maintenance and ion uptake costs are key factors for plant acclimation to high root temperatures (Lyons et al., 2007 Rachmilevitch et al., 2006b, b). With systematics and comparative morphology. Other reports worth reviewing for this chapter emphasize air pollution or the fertility of precipitation and rooting media in tropical forests. 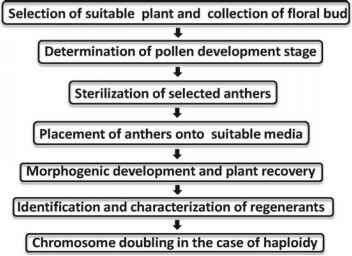 Data on the growth of certain ornamental species in hydroponic and aseptic culture mostly appear in horticultural journals and publications for hobbyists. 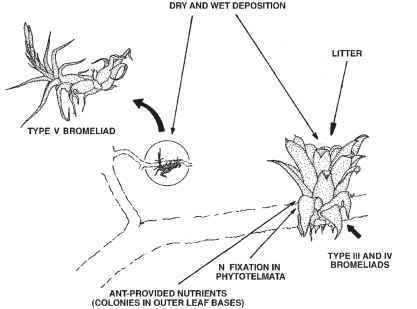 Except for one preliminary survey (Benzing and Renfrow 1974a), no treatment compares Bromeliaceae among vascular flora relative to sources, needs and tolerances for shortages and oversupplies of mineral ions. Our purpose here is to update this summary insofar as the still meager database for bromeliads and extrapolation from other, better-known taxa permit.